Ice diving is a type of diving that takes place under ice. It usually has a single entry and exit point through an ice hole and requires special diving procedures and ice diving equipment. Ice diving is one of the most adventurous types of diving out there and is a great way to try something completely different. It is challenging, takes extra preparation, and is different from most recreational dive types. As a result of this, it gives divers new skills whilst improving upon existing ones and also improves diver confidence in the water. It is a team sport and offers the chance to learn ice diving procedures, such as under-ice communication, and how to work as an ice diving team. Ice diving also offers the opportunity to dive in winter when other types of diving may not possible. Most importantly, ice divers experience unique underwater environments and marine life few people ever get to see. There is nothing quite like the peace of being under the ice, surrounded by bright blue water and ice formations. It is an experience not to be missed and is truly rewarding. 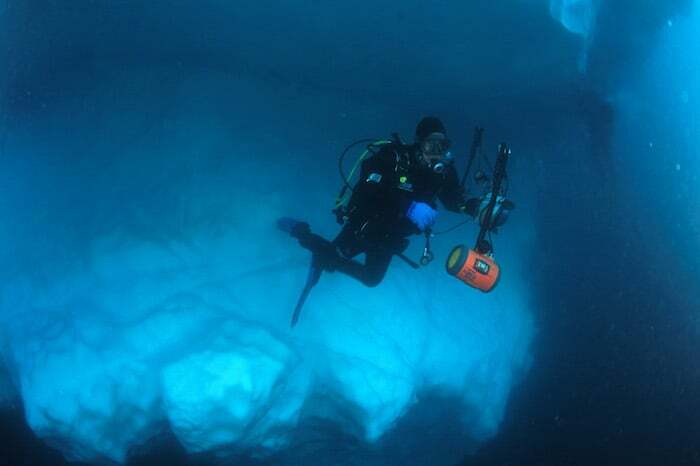 There are a number of well-known ice diving destinations such as the Great Lakes in Canada, Russia’s White Sea, and the various ice diving sites of Alaska, Switzerland and Iceland. ANTARCTICA - Peak season is November to March, with December and January being popular months because of warmer temperatures and sunlight. Those visiting in December and January can enjoy watching young penguins and seals being raised, whereas whale fans should visit during February or March. The water visibility is at its best at the end of the diving season. Diving is available during November to March. ARCTIC - The best time to experience the Arctic is from April to September, with peak tourism season occurring in June to August. April is a great month to enjoy fresh snowfall and the chance to see humpback whales. Narwhals, sea birds and caribou are more commonly seen in later months when the icebergs begin to melt. Polar bear sightings are more common close to shore in July. The marine life of Antarctica is very diverse and includes seals, penguins, and approximately 15 species of whales. Divers have the chance to see sea lions and possibly even swim with leopard seals, fur seals and penguins. Smaller creatures include various fish species, starfish, giant isopods, and jellyfish. All of this can be enjoyed whilst exploring sea caves, underwater ice-formations, kelp walls, and bright blue polar waters. Above water, Antarctica offers excellent bird watching, whale watching, and excursions to areas made famous by early polar explorers such as Ernest Shackleton. Spitsbergen offers equally fascinating marine life including sea snails, sea butterflies, crabs, sea hedgehogs, and starfish. 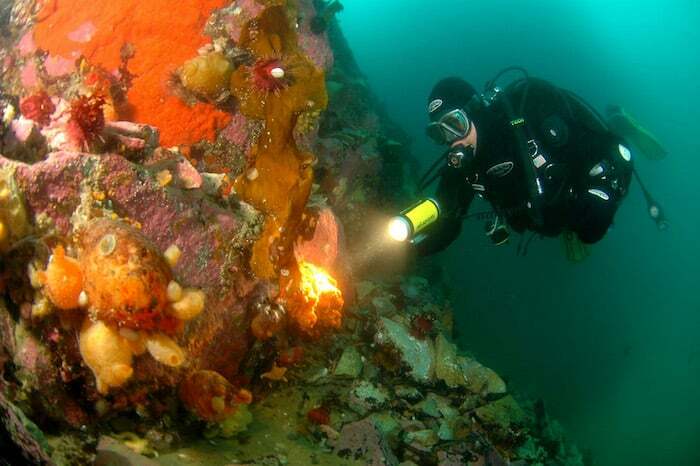 Divers can swim with sea lions, explore the marine life of wrecks, and experience glaciers. Northern safaris visit the wildlife-rich Hinlopen Strait and huge Monaco glacier. Wildlife that may be encountered include bearded seals, walruses, reindeers, Arctic foxes, diverse birdlife and whales. The waters around Spitsbergen are also visited regularly by Minke, Fin, Humpback and Blue whales. Scoresby Sund in Greenland contains a number of islands and is rich in birdlife and Arctic fish such as char, Greenland halibut, wolf fish, sea scorpions, plus the Greenland shark. The fjord is home to a variety of marine mammals including ringed, hooded, harbour, bearded, and harp seals. Walrus, narwhals, polar bears, and beluga whales can also be seen in the area. These destinations are ideal for wildlife and underwater photography whilst diving. What Ice Diving Gear Do Divers Need? Divers joining an Antarctica or Arctic liveaboard cruise need to bring their own dive gear suitable for polar diving. Their dive gear should include a dry suit, appropriate thermal undersuit, hood, gloves, boots, fins, buoyancy control device, mask, snorkel, dive computer, octopus set-up and weight belt. Other equipment that is recommended includes a compass, dive knife and underwater torch. It is important to choose dive gear that is appropriate for polar diving. 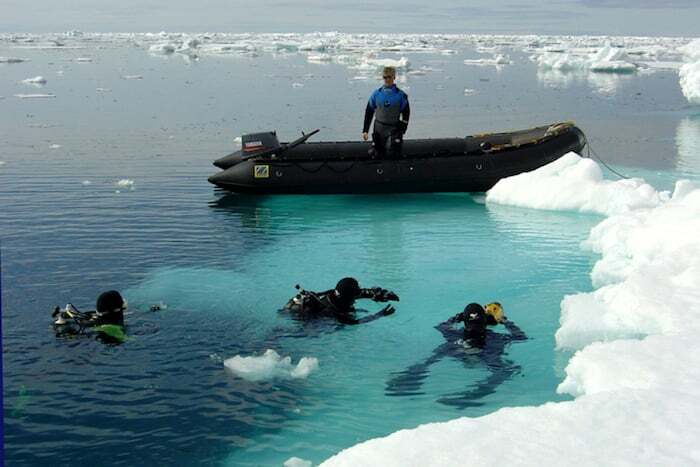 The water temperature when diving in Antarctica is typically 0°C (32 °F). The Arctic water temperature range is 5°C (41 °F) and 0°C (32 °F), whereas Scoresby Sund drops to -1°C (30.2°F). What Are the Main Hazards of Ice Diving? Regulator free-flow is the main hazard of ice diving but can be prevented by following ice diving procedures. Regulators are kept warm prior to diving and free of any fresh water moisture to prevent free-flow. Ice divers also use the right diving gear and set-up to ensure regulator reliability and to dive safety. Other main hazards are the effects of cold on a diver, such as losing the ability to think clearly and maintain hand dexterity. These hazards are again prevented by following ice diving procedures and using appropriate dive exposure suits. What Does It Take To Become A Qualified Ice Diver? People who try ice diving discover a whole new world of diving that can easily become addictive. Divers wishing to take this sport further can complete an ice diving course and become qualified Ice Divers. Dive training agencies such as PADI, SDI, BSAC and NAUI offer ice diving courses. Participants need to be PADI Advanced Open Water divers (or) and at least 18 years old. Some training agencies also require divers to have prior cold water (less than 10 °C) diving experience.